Ditto is an absolutely key Pokemon in Pokemon Go, and that’s despite it not being the sort of Pokemon that could ever rank on the best Pokemon Tier lists – and its unpredictable nature means it isn’t even really very useful for tacking Raid Bosses or toppling gyms. It also can’t be obtained in the usual methods – it can’t be hatched from eggs, has never shown up as a raid reward and isn’t often found as a field research quest reward. It’s a pain. The whole point of Ditto is that it is a disguise-based Pokemon. It likes to shape shift and hide itself as other Pokemon – and that’s what it does in the wild. Essentially, to catch Ditto in Pokemon Go you only have one route open to you – to catch the Pokemon that Ditto is hiding as and hope that Ditto will appear from one of them. 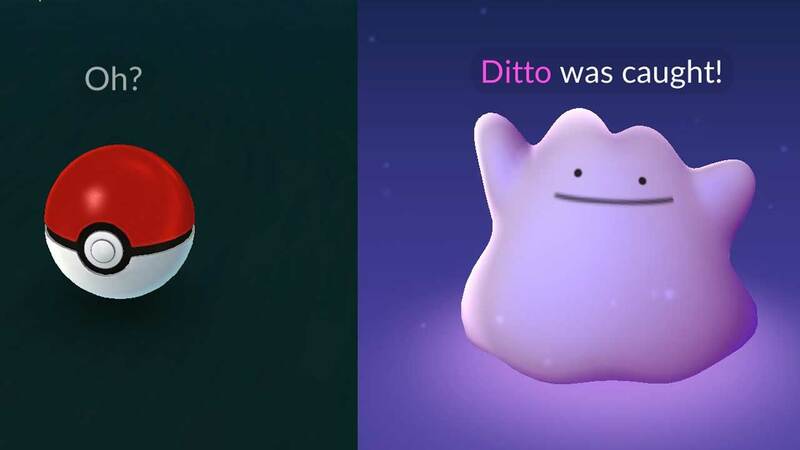 The Ditto List – Pokemon it disguises itself as – is changed every now and then in Pokemon Go, and we’ll do our best to keep this page updated to match that. Ditto doesn’t have any tells – if one is hiding as a Sentret, for instance, it will look and act like a normal Sentret, the sort of Pokemon you might ignore and not catch. Likewise for if it’s hiding as Pidgey, or Zubat, or Gulpin – all you can do is catch it and hope. If a Pokemon is Ditto, you’ll be alerted as to that once the fake Pokemon it’s hiding as has been caught. If you’re struggling to find one of these critters, here’s one tip: Ditto is harder to catch than the Pokemon it hides as. What we mean by this is that a Pokeball is less likely to succeed on a Ditto of the same CP as the Pokemon it’s hiding as – so if you see a lower CP Pokemon from the list on this page that seems to be mysteriously avoiding capture, it might be worth using a berry and an Ultra Ball – that might well be what you’re after, but of course there is no guarantee. The spawn rate is pretty brutal. Generally, you shouldn’t sweat it too much about Ditto even when your special research missions rely on it. It’s not something that’s possible to farm, given the very long odds of the ditto spawn rate – just keep playing and eventually it’ll happen. As mentioned earlier, this isn’t a Pokemon that’ll change your life in terms of battles – in fact, it’s largely useless in battle. So just take it easy. So, as outlined above, here’s the Ditto list of Pokemon that when seen in the wild might actually be a disgused Pokemon. Consider these Ditto forms, if you will. This list changes periodically, but you’ll want to catch these Pokemon when you find them – just in case it’s our slimy, shape shifting friend in disguise.